The reaction shield is a unique piece of equipment that MMA practitioners love. It has a shape that is different than most striking pads. It�s the top portion that makes this item special. Instead of 4� thick the top third of the shield is 10� thick. 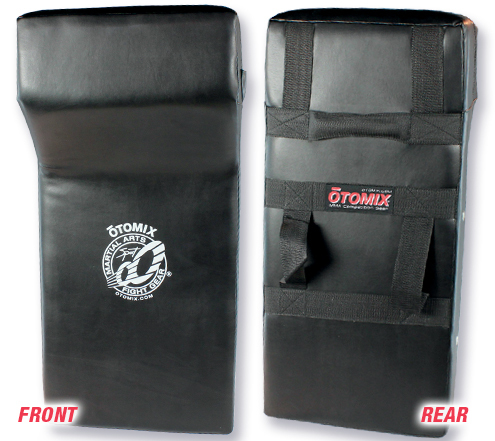 This makes it an ideal pad for knee strikes and uppercuts but can still be used as a traditional shield. The shield is made of a black vinyl covering with an inner core of dense foam. The top double thick portion has additional padding. The back of the shield has two reinforced forearm straps and a handle for secure holding. The shield measures 29� high by 14� wide and 4� thick.